My plan for 2014 is to average two big races a month, preferably one half marathon and one full marathon. However, some months will have two full marathons, and some months, like February, may not have any full marathons at all. In any event, this is the year I want to focus on quality while still maintaining some level of quantity. 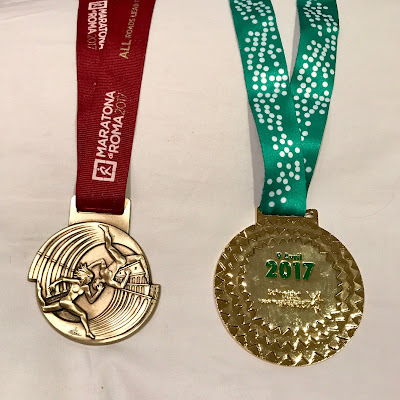 Also, I said I’d blog more this year, and here I am writing about my first race of 2014 within just a few days of the race. 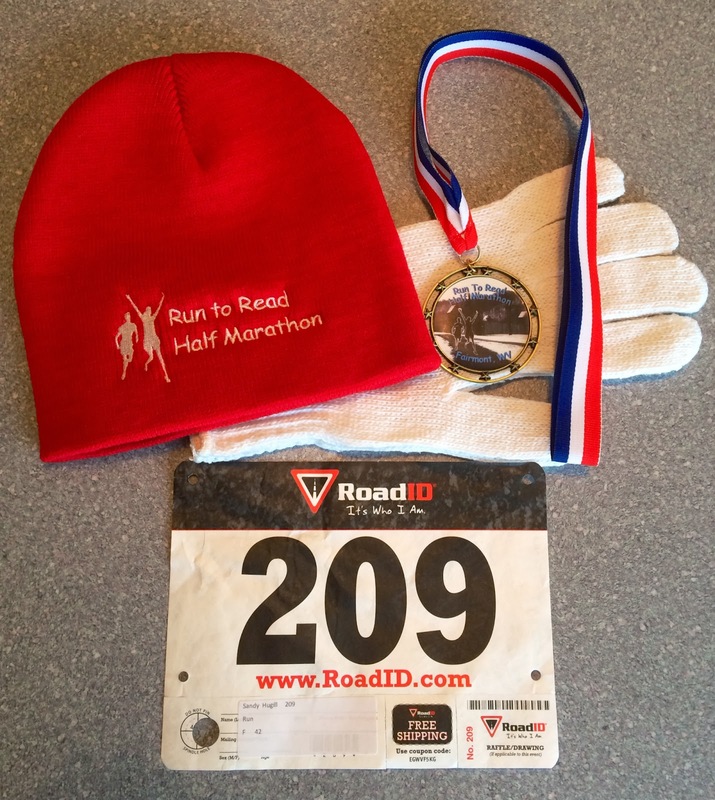 I searched for a January half marathon and found the Run to Read Half in Fairmont WV. This was a small, low-key race that benefits Literacy Volunteers of Marion County and is held in beautiful Prickett’s Fort State Park south of Morgantown WV. Our friend Christy lives in this general area, so that helped convince Scot to join me for this race. In the end, Christy’s schedule only allowed her to cheer us on at the start, but not stay and run. We were happy to see her even for a short time. 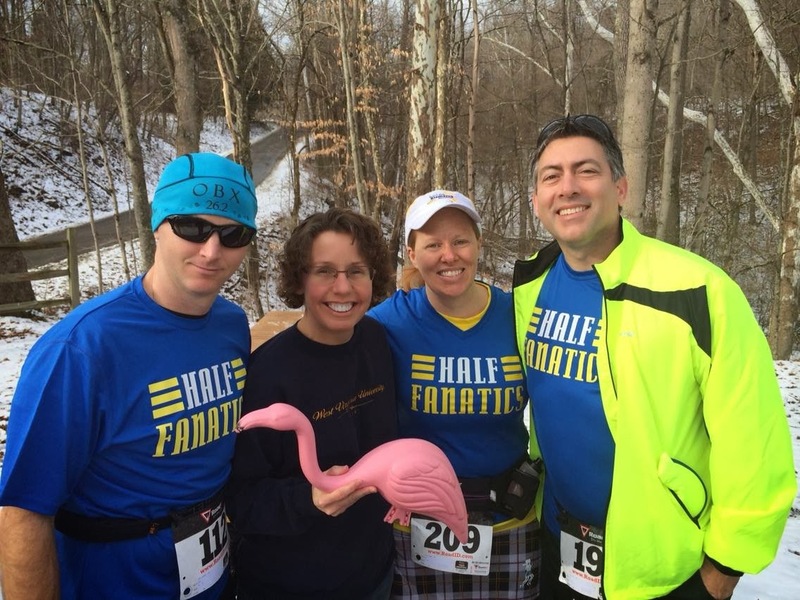 There were several Half Fanatics at this race, most of whom I did not know. The exception was Donnie from Nashville. I hadn’t seen him since the XTERRA Oak Mountain trail marathon in Alabama last May. It was nice to see him again, and Scot and Donnie got to meet for the first time. The day was cold on January 5th in West Virginia. The race started at 2:00 PM, an unusual afternoon start. This meant that the temperatures that started out in the 40s would be dropping as the afternoon went on and the sun began to set. I felt adequately dressed at the start, but neglected to take along gloves. The gloves I didn’t need at 2:00 PM would have been welcome by 4:00 PM; my fingers became very numb. Otherwise, I have no wardrobe regrets. 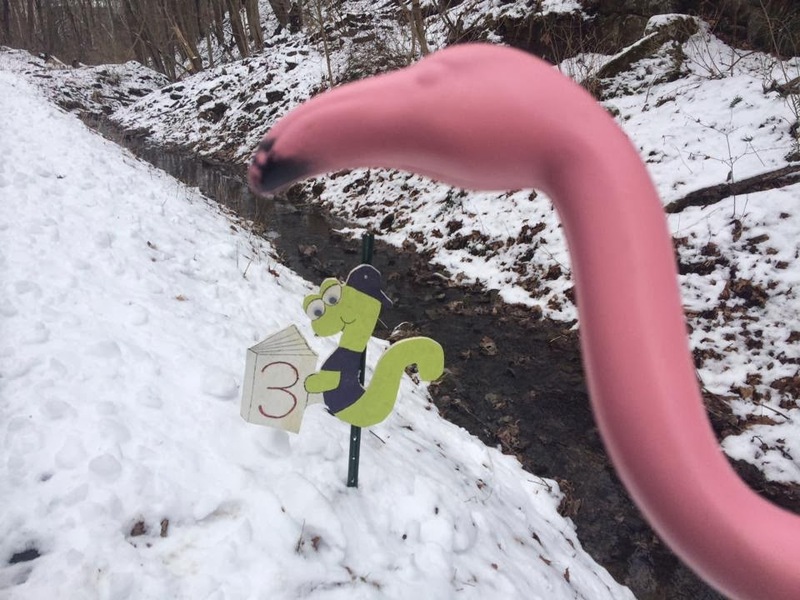 It had snowed in Fairmont, and there was still snow on the ground, but the course was mostly clear. The first out-and-back was on an asphalt trail that had been plowed. The second, longer, out-and-back was on a dirt/crushed limestone surface and did have snow in places, requiring some careful foot placements. I’m happy to say that I did not slip once. 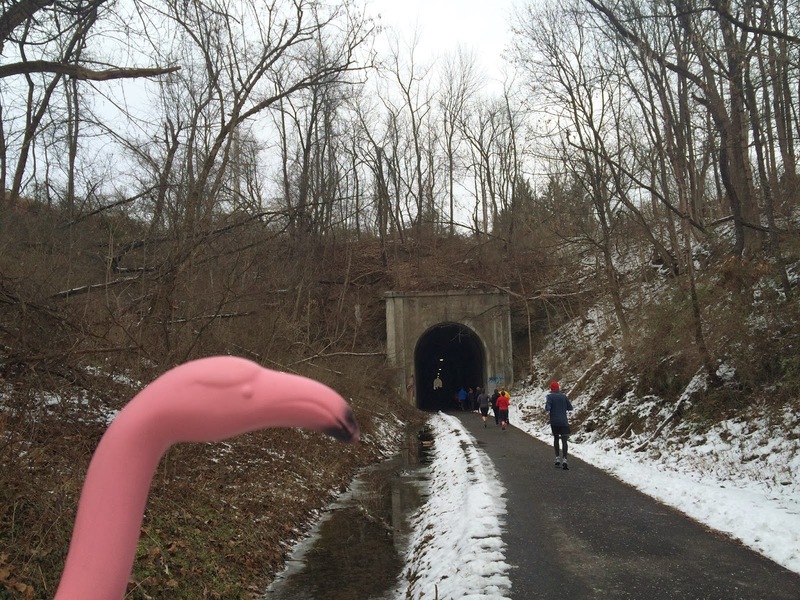 It was good to be out getting some miles in, even if it was cold. The portion of the course along the lake was just gorgeous and I kept imagining what it would look like during any other (warmer!) season of the year. The race staff/volunteers were pretty friendly, and the event was fairly well organized. This was the first year for this race to offer finisher medals. They weren’t fancy, but hey…we got medals. We also got hats and gloves instead of a t-shirt, and I thought that was appropriate. After I finished, setting zero records and just being happy to be done, I was frozen. Scot and Donnie had come out to run in the last 10th of a mile with me, then we headed inside for the food. Unfortunately, they were out of veggie chili, so I got a cookie. Donnie got a recommendation for a family owned Italian restaurant named Muriale’s, and that ended up being a great decision. We enjoyed warm pasta, post-race beer and good conversation before Scot and I had to start our 3.5 hour drive home. 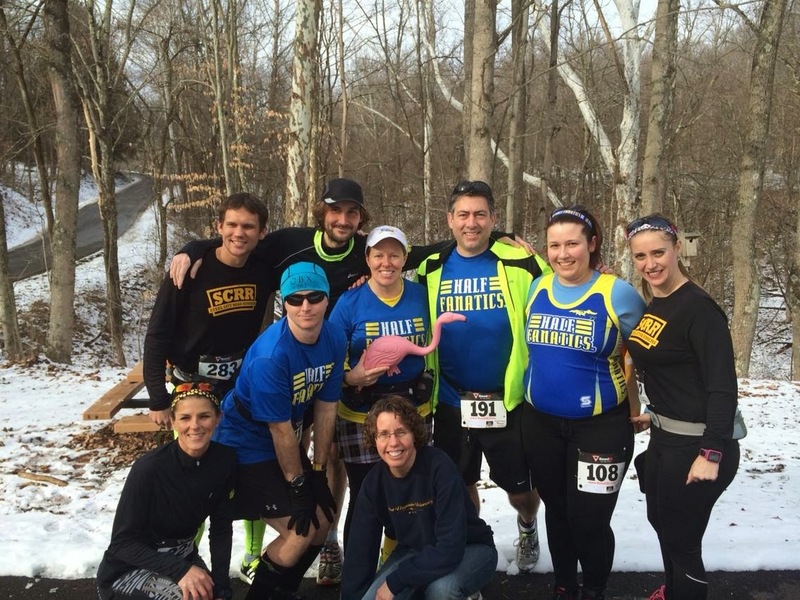 We said goodbye to Donnie and to our Run to Read Half Marathon day, and I felt really good about getting in my first race of the year on the first weekend of the year. Two weeks to Houston! I am from Fairmont and ran in the race as well. Loved the flamingo and glad you got to experience Muriale's...it's a favorite of everyone around here! Next time I'm in Fairmont (who knows when??) I will definitely remember Muriale's!